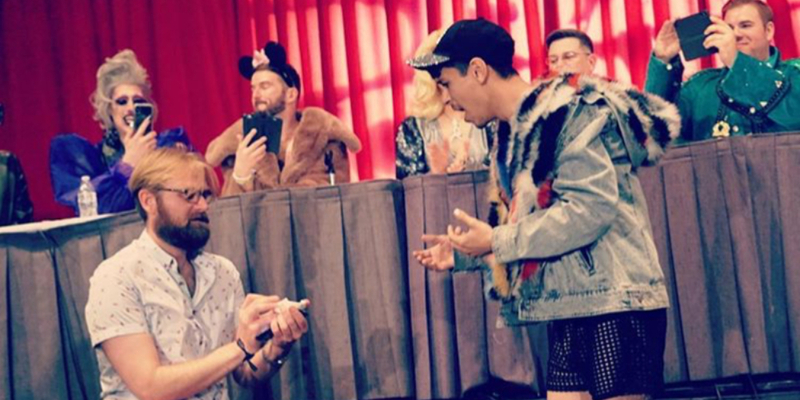 A RuPaul’s Drag Race fan proposed to his boyfriend at DragCon in Los Angeles over the weekend. After fleeing homophobic abuse in the south, Alex Thornton and Christian Gomez moved to California to find a better and more welcoming community. The DragCon proposal happened at the end of the Committed Queens panel with Ginger Minj, Chad Michaels and Dusty Ray Bottoms. I was the moderator, and I called on Alex to ask a question when he started telling the emotional story of the pair’s coming to California before getting down on one knee. They explain that living in Missisippi, watching Drag Race was one of the only outlets for queer expression. Then, one night, the homophobic culture of the south got to them, when they were taunted during a date night to the movies.